"—Because you don't save, Mr Deasy said, pointing his finger. You don't know yet what money is. Money is power. When you have lived as long as I have. I know, I know. If youth but knew. But what does Shakespeare say? Put but money in thy purse. 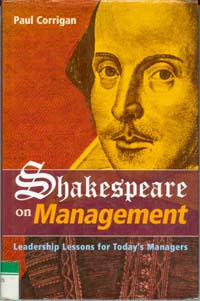 Several years ago a spate of business books hit the bookstore shelves offering advice culled from the life and works of great writers like Shakespeare. The idea was simple: if you examine the words of great writers, you'll surely distill some valuable management gems and business secrets that will help solve real life problems. 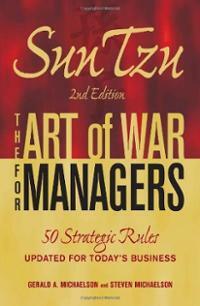 A series of other books were soon published on the application of management principles drawn from the lives and works of Sun Tzu, Winnie the Pooh and Jesus. Knowing of my interest in Joyce, a friend, who teaches at one of Canada's leading MBA schools, once tried to persuade me to write a business book about Joyce's business and leadership secrets. He suggested I call the book "James Joyce on Management" and he assured me that I'd have a runaway bestseller on my hands. After I stopped laughing, I gently broke the news to him that Joyce was one of the lousiest businessmen in literary history. 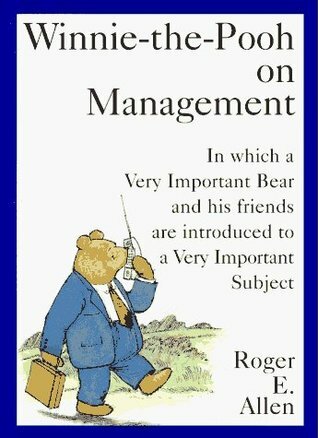 Despite my utmost respect and admiration for Joyce, I'd sooner take business advice from Piglet. For most of his life, Joyce was hopelessly in debt. He was constantly scrounging money from friends, family and colleagues. When he did have money in his pocket, he'd invariably splurge lavishly: eating at fine restaurants, drinking expensive Swiss wine and ordering rounds of drinks for his friends and anyone else fortunate to be around the bar when Joyce was flush. Quite often, after a night of eating, drinking and revelry, he'd leave the restaurant in a drunken stupor with nothing left to pay his rent. There's a famous photograph of Joyce standing outdoors with a quixotic look on his face. When asked what he was thinking about while being photographed, Joyce said "I was wondering would he lend me five shillings." This is not to say Joyce didn't have an entrepreneurial spark. 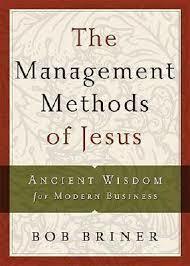 He had several clever business ideas, yet he was incapable of successfully implementing them. He concocted a scheme to sell Irish Tweed in Trieste, that never got off the ground. In late 1909 he spearheaded a project to open the first movie theatre in Dublin. However, the cinema, named the Volta, offered an eclectic selection of foreign language movies that didn't appeal to the English-speaking Dubliners. After several months, Joyce sold his interest in the Volta for a loss. So how did Joyce support himself and his family? When Joyce first settled in Trieste, he began working as an English teacher at the Berlitz school. Joyce's heart wasn't into his lessons, and he spent much of his time peppering his students with questions that would encourage answers he could use as fodder to support his writing. Still, Joyce's services were in demand - and he befriended many of his students (and, naturally, regularly sponged money from them). When money got extremely tight, Joyce wrote to his younger brother Stanislaus in Dublin and summoned him to come live in Trieste. Stanislaus idolized his older brother, appreciated his talents, and found it difficult to refuse his requests. 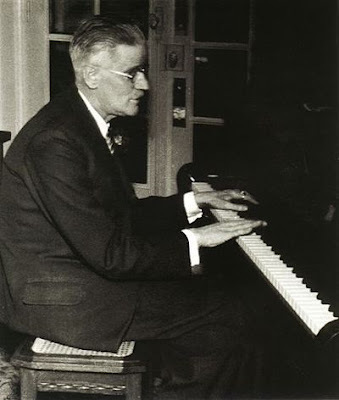 He arrived in Trieste in 1905 and started working as an English teacher at the Berlitz School alongside his brother. Soon after, a large share of "Stannie's" salary was used to support his older brother's lifestyle. Another way that Joyce supported himself was through the generosity of his patrons. In one of my earlier posts I wrote extensively on the generous patronage of Harriette Shaw Weaver, who is estimated to have given Joyce well over a million and a half dollars throughout his lifetime. Another quirk about Joyce was that he was notoriously litigious. He steadfastly defended his intellectual property rights to prevent an American interloper from illegally selling a pirated copy of Ulysses in The United States. In his later years he engaged in an almost comical lawsuit against a Canadian named Henry Carr, who worked in the local consulate office. While living in Zurich Joyce received a gift of money from a patron and decided to organize an English theatre group that would perform Oscar Wilde's "The Importance of Being Ernest." In a decision he would soon regret, Joyce recruited Carr to be the male lead in his play. Joyce and Carr soon got into a nasty dispute about theatre tickets and who should pay for the pants Carr wore in a theatrical performance. Joyce refused to pay and Carr called him a "cad" and a "swindler." Joyce sued for libel and Carr countersued. In the end, it was a split decision, yet Joyce's losses were greater than his earnings. Author Tom Stoppard wrote a wonderful play called "Travesties" that premiered in 1974 that featured the dispute between Joyce and Carr. Notably, Joyce had a vengeful streak. He ultimately exacted revenge against Carr by naming one of the most unsavoury characters in Ulysses after him (the boorish Private Carr in the Circe episode). While Carr may have tied the legal battle against Joyce, he lost the war, and his name will go down in infamy, eternally associated with a foul-mouthed violent bully. Now back to the central question of this blog: Can a reader garner any business advice from fiction? Conveniently, Joyce deals with this very point in Ulysses, and effectively illustrates the pitfalls of blindly quoting Shakespeare to make a point. In the second episode of Ulysses, Garrett Deasy, the bigoted schoolmaster, tries to persuade Stephen Dedalus to save some money from his salary by quoting dialogue from Shakespeare (see quote at the outset of this post). However, the message goes lost on Dedalus, who adeptly realizes that Deasy is quoting from Iago, one of the most inhuman, evil characters in literature. Come to think of it, countless cheapskates over the years have failed to help a person in need by quoting Shakespeare's famous line: "neither a borrower nor a lender be," likely unaware it's a quote from the blustering busy-body Polonius, who Hamlet calls a "tedious old fool." It goes to show you...when someone tries to punctuate an argument by quoting Shakespeare, check out the source and the context. If the advice comes from one of Shakespeare's notorious villans, run. In the penultimate chapter of Ulysses, Leopold Bloom questions whether reading Shakespeare's works, not for pleasure but as a mode of instruction, would provide solutions to difficult problems in real life. "In spite of careful and repeated reading of certain classical passages, aided by a glossary, he had derived imperfect conviction from the text, the answers not bearing in all points." So here's a tautology: by reading Ulysses you learn that you won't find the answers to your problems by reading literature. While I wouldn't recommend holding up Joyce as a business guru, I would contend that a great deal of insight into marketing and advertising can be gleaned by reading the words and thoughts of the main character in Ulysses: Leo Bloom. Bloom is an experienced and talented advertising canvasser - and over the years he's developed a finely-tuned head for analyzing and assessing the effectiveness of ads. Perhaps in my next post I'll take a closer look at advertising from the perspective of Bloom: literature's quintessential "Ad Man". "—I'm going round the corner. Be back in a minute. —You don't want anything for breakfast? No. She didn't want anything. He heard then a warm heavy sigh, softer, as she turned over and the loose brass quoits of the bedstead jingled. Must get those settled really. Pity. All the way from Gibraltar." Henri de Toulouse-Lautrec: "The Bed"
Continuing my odyssey to illustrate select episodes of Ulysses using famous works of art, this post addresses the 4th episode of the novel, Calypso, where we first meet Leopold Bloom and his wife Molly. It's about 8 a.m., and the couple are in their house at 7 Eccles Street in Dublin. Bloom is in the kitchen preparing breakfast for himself and Molly; she remains upstairs asleep in their bed. Bloom decides to take a short walk around the corner to buy a pork kidney for breakfast. Before he leaves, he stands in the hallway and gingerly asks Molly if she wants anything. She responds with a plaintive "Mn." Nope, nothing. 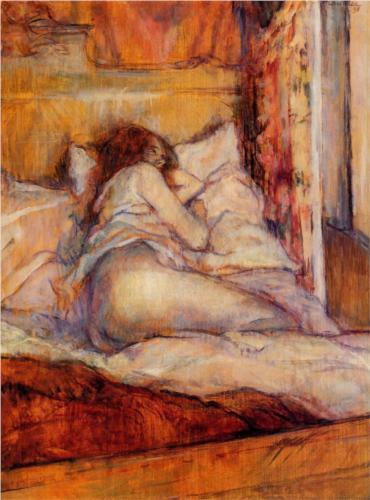 Toulouse-Lautrec's painting "The Bed" does a lovely job of illustrating the bedroom scene in Calypso. You can almost sense Molly's "Mn" and hear the jingling of the bedsprings as she turns about. Coincidentally, the painting's colour palette reflects the mood that Joyce likely intended for this chapter. To assist his friends in understanding Ulysses, Joyce created two guides (known as schemas) summarizing the structure of each episode. In each schema, he indicates the title of each episode, the time it takes place, the predominant colour of the chapter, and various other bits of information. While these guides are not identical, each schema indicates that the predominant colour of the Calypso episode is orange. Here are links to the Linati and Gilbert schemas. Next, Bloom leaves his home and sets out on his first journey of the day. 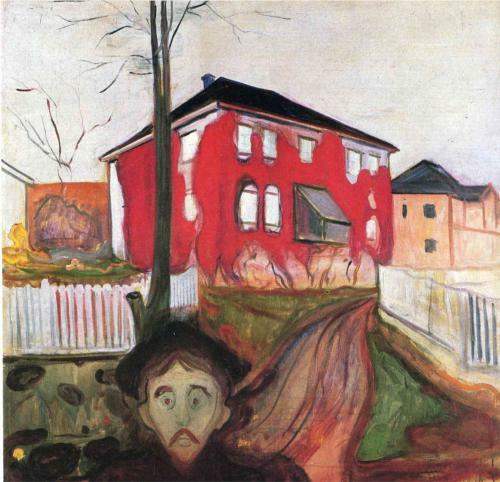 The painting below, "Red Virginia Creeper" by Edvard Munch, portrays an image of a man leaving a house. I particularly like the slightly bewildered expression on the character's face as he begins his trek for the day. In the Linati schema, Joyce identifies the meaning of the Calypso episode as "a departing wayfarer" -- and Munch's Bloom-like character in the forefront of Munch's painting fits the bill. Edvard Munch's "Red Virginia Creeper"
We get full access to Bloom's interior monologue as he takes a short walk on Eccles Street to Lower Dorset Street. He greets a friend, sizes up the economics of the street, and makes his way to Dlugacz's butcher shop to buy a pork kidney. Ironically, Dlugacz (the person selling the pork) and Bloom (the person buying the pork) are both of Jewish origin. The incongruity of two Jews transacting pork was not lost on Joyce. So much for keeping kosher. 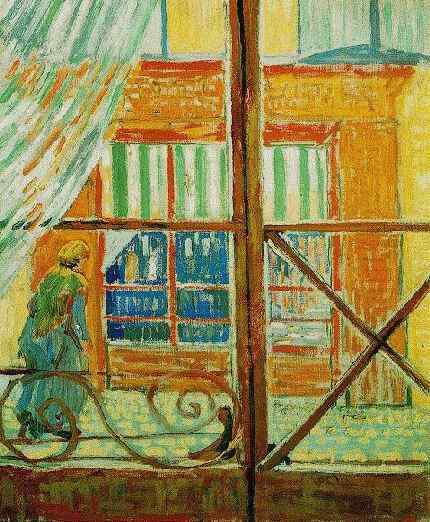 Below is a painting by Vincent van Gogh called "A Pork-Butcher's Shop Seen from a Window" which presents an image that fits beautifully with this episode (the shop is even painted orange - the colour alluded to in Joyce's schema). Vincent van Gogh's "A Pork-Butcher's Shop Seen from a Window"
Like the writing style of Calypso, each of the three paintings in this post depict relatively clear imagery -- they are not abstract. Similarly, the Calypso episode is one of the easiest chapters in Ulysses to understand, and the writing style contains enough narrative commentary to provide context to guide the reader through the events. While the episode does contain a fair amount of interior monologue (to use a phrase from my previous post, the Joyce-o-scope is "in full bloom") -- Bloom's thoughts are far easier to understand than the complex thoughts of the philosopher-poet Stephen. After buying the kidney, Bloom returns home and picks up the mail on his doorstep. He finds a letter from his daughter Milly, and a letter for his wife from Blazes Boylan, the organizer of an upcoming concert tour featuring Molly. In a subsequent chapter we learn that Boylan clandestinely returns to 7 Eccles Street later that afternoon to engage in a sexual affair with Molly (but we'll save that tryst for another post). Upon his return, Bloom heads up to the bedroom and gives Boylan's letter to Molly, who surreptitiously slips it under her pillow. Bloom and Molly begin to chat, but their discussion is cut short when Molly smells Bloom's kidney burning. After running downstairs to save the kidney, Bloom sits down to eat his breakfast, reads Milly's letter and retires to his outhouse to scan an Irish magazine called "Titbits" (in an extreme, yet unintended, act of literary criticism, he ultimately tears off a page of the journal to use it as toilet paper). All in all, Calypso is a very accessible and readable chapter. Most readers who have made it through the turbulent complexity of the first three chapters find it a welcome respite. "He comes, pale vampire, through storm his eyes, his bat sails bloodying the sea, mouth to her mouth's kiss. Here. Put a pin in that chap, will you? My tablets. Mouth to her kiss. No. Must be two of em. Glue em well. Mouth to her mouth's kiss." 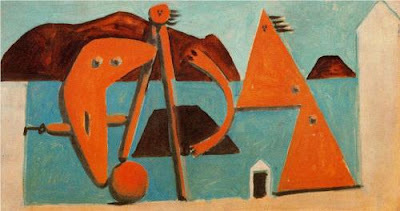 Pablo Picasso's "Figures at the Seaside"
Since many of the readers of this blog are art lovers, I thought I'd once again feature works of art as visual aids to demonstrate the various writing styles and narrative approaches used by James Joyce in Ulysses. Let's start with episode 3: Proteus -- one of the most challenging and dense chapters in Ulysses. In Proteus, the brilliant aspiring poet, Stephen Dedalus, walks on the beach at Sandymount strand in southeast Dublin and every thought that flickers through his over-educated brain makes it into this chapter. Some refer to the technique used in the episode as "stream-of-conciousness," yet Joyce derided the term, saying whenever he heard the phrase he thought of a stream of urine. A good way to explain this episode's technique is to imagine that someone has invented a machine that could read a person's thoughts and automatically translate them into words on a page (let's call this machine a "Joyce-o-scope"). In Proteus, the Joyce-o-scope is turned on full-force and gives us a remarkable window into the inner workings of Stephen's complex, yet troubled, brain. Stephen's mind is packed full of philosophy, languages, paternity, family, relationships, remorse, todo lists, and on and on. He has flashbacks, picks his nose, gets frightened by a dog, and begins writing a poem (which I've included as the quote at the outset of this blog). In short, his brain is an intellectual and emotional three-ring-circus; and we have a ring-side seat. Don't expect too much in the way of context to frame Stephen's interior monologue. It is what it is. Joyce shows exactly how Stephen thinks, and he purposely doesn't make it easy going. When you begin reading this chapter, don't even try to understand everything Stephen is thinking; just fasten your seatbelt, hold on tight, and enjoy the opportunity to view the unfiltered thoughts of a talented, creative, yet somewhat tormented, artist. "Ineluctable modality of the visible: at least that if no more, thought through my eyes. Signatures of all things I am here to read..."
This refers to the Aristotelean idea that when we look at something -- say, a horse -- we don't actually see the object in front of us; rather, our minds perceive an image of a horse that we've each built up over the years. Stephen recognizes that we use mental shortcuts to immediately recognize and categorize forms; we perceive the concept of an object, rather than seeing what actually lies before us. We learn much later in Ulysses that Stephen had broken his eyeglasses the previous day, so his vision is blurred and he must rely more upon his other senses, particularly sound, to perceive the world around him. As such, in this episode, Stephen becomes obsessed with the changing face of reality, and struggles to understand how humans conceptualize the world around them using visual and audible clues. 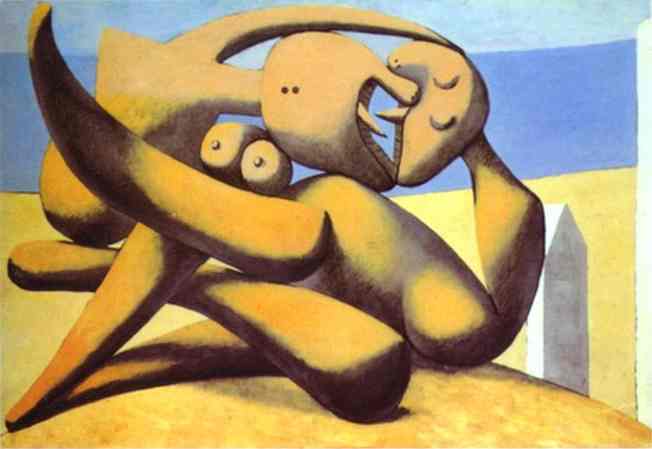 To me, the work of art that best encapsulates Joyce's writing style in this episode is Picasso's "Bathers on the Beach." Picasso's "Bathers on the Beach"
As in Joyce's Proteus episode, the scene in Picasso's painting takes place at the seaside and reality is morphed and transformed. Things aren't as they appear -- yet our minds still draw conclusions based on scanty evidence. 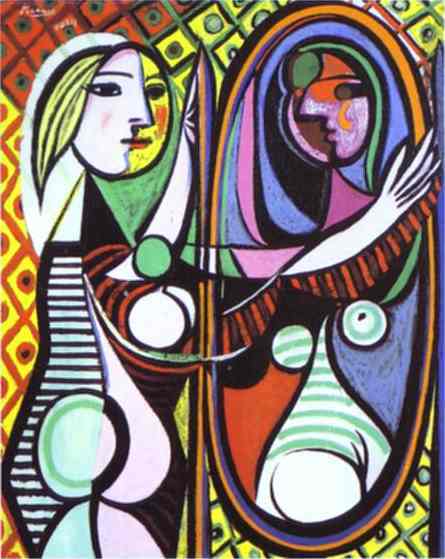 The forms in Picasso's paintings have grotesque and misshapen heads, their bodies are mostly absent, yet we somehow see them as humans, expressing emotions and relating to each other. In Proteus, Stephen uses a cane to navigate the seaside, and tries to unlock a series of metaphysical and philosophical problems; and in the painting, one of Picasso's characters wields a key and a cane. 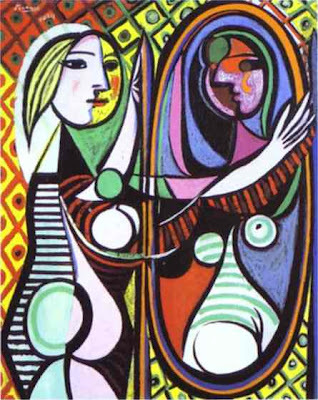 Like the characters in Ulysses and Picasso's painting, we try to unlock and read signatures around us, and discover that reality and our concept of reality are not always the same. "Laughing again, he brought the mirror away from Stephen's peering eyes. —It is a symbol of Irish art. The cracked looking-glass of a servant." I'm delighted by how many people have told me they've recently picked up a copy of Ulysses and started reading. Yet some new readers have told me that they're finding it daunting to grasp everything that's happening in the novel, and they're thinking about giving up after a couple of chapters. Rest assured, if you're feeling confused after embarking upon Ulysses, you're not alone. To those who find themselves stumped by Ulysses, my advice is simple: "Read on...and stop trying to understand everything that's happening. It's impossible to follow every element of the plot on first reading -- don't even try." Here, Picasso breaks up the image of a guitar player into its constituent elements, and then reassembles the parts into a form that includes a variety of perspectives. This cubist image has no single point of view. While there are some identifiable images (like an ear, a nose, a collar, etc. ), the entire picture is, on the whole, an abstraction. Hypothetically, you could try to reconstruct this image back into a traditional perspective and figure out what the guitar player really looks like. 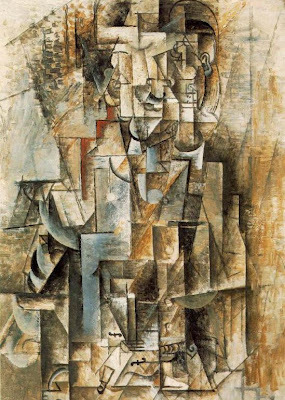 You'd end up with a photographic-like image of a man playing guitar -- but you'd lack the creativity and emotion of Picasso's cubist painting. Similarly, Joyce intentionally wrote Ulysses from various perspectives and points of view. It should be no surprise that the reader would feel some confusion and discomfort. Ulysses isn't meant to be read like a traditional novel; rather, it's meant to be reread....and reread. After each reading you gain more context, find new links and better understand how the pieces fit together. If you're seeking to grasp every element of the plot of Ulysses in one reading, you're in for a rough ride. Don't get me wrong, I'm not saying that context isn't important in Ulysses. The book becomes infinitely richer as you fill in the blanks and understand how everything fits together. What I'm saying is that reading Ulysses is a process that entails looking first at the broad canvas and then, ultimately, bearing down and appreciating the fine brush strokes. Laughing again, [Mulligan] brought the mirror away from Stephen's peering eyes. "The nineteenth century dislike of realism is the rage of Caliban seeing his own face in a glass. Wilde's quote, in isolation, is a clever comment on how art reflects the spectator as much as it reflects the subject. Yet, once you consider the other references in Ulysses, you see that Stephen's comment has bite. Stephen says that the Irish look at themselves through a distorted mirror -- and are really a Caliban-like race that serves the British. That's powerful stuff for a book written almost a century ago! But you don't get the reference unless you understand the context. Bottom line: at first, it's okay not to understand every plot twist in Ulysses; at the outset you can let go of the details and concentrate on the big picture. But, ultimately, the revolutionary power and pleasure of Ulysses intensifies as you gain insight and attain context -- and that takes time. "Do fish ever get seasick?" What's the deal with Ulysses? Joyce believed that birthdays were important. To make this birthday joyful, I thought I'd write a short and sweet post focusing on humour in Ulysses. I've often compared Ulysses to Seinfeld. When you peel back Ulysses's creative writing styles and analogies to Homer's Odyssey you won't find any hidden meaning -- it's a book about nothing. Below are a few of the random musings of Leopold Bloom in Ulysses...just imagine Seinfeld delivering these lines in a comedy bit about food and you'll get the picture. "...why is it that saltwater fish are not salty? How is that?" "All the odd things people pick up for food....out of the sea with bait on a hook. Silly fish learn nothing in a thousand years." "That archduke Leopold ... used to eat the scruff off his own head? Cheapest lunch in town." "...what about oysters. Unsightly like a clot of phlegm. Filthy shells. Devil to open them too. Who found them out?" "Swans ... swim down here sometimes to preen themselves. No accounting for tastes. Wonder what kind is swanmeat. Robinson Crusoe had to live on them." Sound like Seinfeld? It's not -- it's all Joyce's main character: Leo Bloom. Joyce created the observational humour routine decades before Seinfeld was born. "Do women know about shrinkage?" "What do you mean, like laundry?" "Like when a man goes swimming... Afterwards..."
James Joyce called it "The scrotumtightening sea"
Most everyone assumes Seinfeld broke new ground with the "shrinkage" episode. But the truth is: Joyce had already been there -- done that. Generations ago. "Aleph Beth Ghimel Daleth Hagadah Tephilim Kosher Yom Kippur Hanukah Roschaschana Beni Brith Bar Mitzvah Mazzoth Askenazim Meshuggah Talith." Believe it or not, it's an actual word-for-word quote right out of the pages of Ulysses. Go figure. "The pity is the public will demand and find a moral in my book — or worse they may take it in some more serious way, and on the honor of a gentleman, there is not one single serious line in it." Cue the Seinfeld theme, and fade out. What happened on Tuesday January 29, 2013? Wendy Weaver, Michael Groden and Michael Sherman met for coffee at the Starbucks in the Indigo Bookstore in the Manulife Centre to discuss James Joyce and to decide where to donate a 92-year-old copy of an historical periodical, known as the Egoist. Wendy is a Toronto artist who is a distant relative of Harriet Shaw Weaver, James Joyce's patron and publisher. Wendy is a frequent visitor of the Neilson Park Creative Arts Centre in Etobicoke, which Sherman's sister manages. Wendy owns a copy of volume 6, No. 5 of the Egoist that was published in December 1919 by her great aunt. Wendy's copy of the Egoist includes a serialized excerpt from James Joyce's Ulysses which appeared two years prior to the novel's publication. Michael Groden was born in Buffalo in 1947 and graduated from Dartmouth College (B.A., 1969) and Princeton University (M.A., 1972, Ph.D., 1975). He moved to Canada in 1975 to teach at the University of Western Ontario and is now Distinguished University Professor in the Department of English there. He is the author of "Ulysses" in Progress (Princeton University Press, 1977) and "Ulysses" in Focus: Genetic, Textual, and Personal Views (Florida James Joyce Series, University Press of Florida, 2010; paperback, 2012), general editor of The James Joyce Archive (63 volumes, Garland Publishing, 1977-79), compiler of James Joyce's Manuscripts: An Index (Garland Publishing, 1980), and co-editor of The Johns Hopkins Guide to Literary Theory and Criticism (Johns Hopkins University Press, 1994; 2nd edition, 2005; Chinese translation, 2011), Genetic Criticism: Texts and Avant-textes (University of Pennsylvania Press, 2004), Praharfeast: James Joyce in Prague (Litteraria Pragensia, 2012), and Contemporary Literary and Cultural Theory: The Johns Hopkins Guide (Johns Hopkins University Press, 2012). Michael Sherman is a Toronto-based communications strategist and lawyer. He's written speeches for CEO's and senior executives of some of Canada's largest corporations. Michael is also principal of the communications consultancy firm: Trilogy Inc.
Why is the Egoist so special? On January 22, 2013 Kate Taylor from the Globe and Mail wrote an article about Wendy's copy of the Egoist entitled "How much is a 92-year-old magazine with an historic excerpt worth?" How much is a 92-year-old magazine with an historic excerpt worth? Wendy's copy of the Egoist is the last edition printed -- one of just 400 copies. It's hard to say what it would fetch in an auction. A first edition copy of Ulysses could easily sell for over $100,000, but since this is a magazine, it would likely sell for far less. Still, as it is the last edition and its originality can be easily authenticated, it is likely of significant value. What else is in the Egoist magazine? The magazine also includes one of T.S. Eliot's most famous articles: "Tradition and the Individual Talent" and a poem from William Carlos Williams called "Chicago." we can be quiet together. stays with me half through the night. I awake smiling but tired. To whom will Wendy be donating her copy of the Egoist? Wendy decided she would donate the Egoist magazine to the University of Toronto, thereby keeping the magazine in Canada's largest city where it can be seen by the most people while remaining in this country. Groden had completed some research on Wendy's behalf and discovered that University of Toronto did not have a copy of an original edition of the Egoist, and he surmised that they would be very pleased to receive one. To have sustained no positive loss. To have brought a positive gain to others. What did Wendy, Sherman and Groden see on the bar of the Starbucks? Two grande cappuccinos for Wendy and Sherman and a grande Awake! tea for Groden. Black. Sherman, having the advantage of several minutes at the initiation. What else did Groden and Sherman agree to at the meeting? With Wendy Weaver's enthusiastic encouragement, the two agreed to jointly teach a course on the joys of reading James Joyce's Ulysses. The course will be held in Toronto and will take place in the Spring. They expect the course to take place over an eight-week period, with one three-hour class each week at a venue to be announced, possibly at the University of Toronto or the Neilson Park Creative Centre. How will Groden and Sherman market this course? Several ways, including via this blog. How can prospective students show their interest in taking this course? If you are interested in signing up for a course about the joys of reading James Joyce's Ulysses -- please send an email to alesamjon@gmail.com. The course will be limited to about about 20 students. At this stage there's no commitment, we only ask for expressions of interest. If there are enough people showing interest, the course will go forward. It's still a work in progress, but it will likely be at the going rate of a continuing education course. Who was the first person to express an interest in taking this course? Nora Barnacle: James Joyce's lifetime companion and wife. 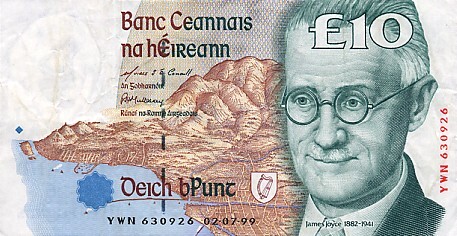 Those of you who have been following this blog know that my wife doesn't share my interest in James Joyce. Not a bit. She hasn't read Ulysses and refuses to go anywhere near anything Joyce has written. Yet she does love traveling and exploring new places -- so fortunately, over the years, we've discovered a few creative ways to intersect our interests. In an earlier post I wrote about how my wife and I spent a wonderful vacation in Ireland a few years ago. After enjoying three days of walking around Dublin and seeing the sites, we decided to rent a car and see some other parts of the country. We travelled westward via Ireland's southern perimeter, stopping for a while at Kenmare, which served as a base to explore the spectacular landscapes of the Kerry and Bearra Peninsulas. They're the closest thing I've ever seen to God's country. After visiting the breathtaking Cliffs of Moher, we took a ferry across the Shannon River towards the central port-city on the west coast of Ireland: Galway. When we arrived, we were surprised to find Galway bustling with activity and entertainment -- we came in the midst of Galway's annual arts festival and there wasn't a vacant hotel room to be found anywhere. We spent what seemed like hours trekking from hotel to hotel searching for an elusive room - and finally landed a small place to stay above a pub near Galway's central Eyre Square. Galway offers an eclectic mix of historic monuments (such as the Spanish Arch), shops, seaside promenades, music and rows upon rows of restaurants with great seafood and inviting patios. 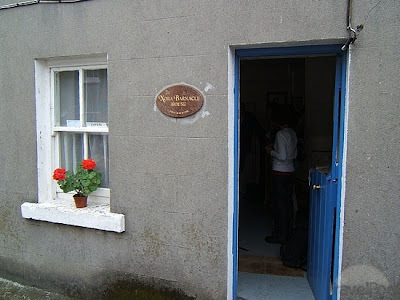 Galway also happens to be the birthplace of Joyce's lover, companion and later his wife, Nora Barnacle -- and I could hardly wait to visit the house where she was born, which at the time, had been transformed into Ireland's smallest museum. Surely my wife wouldn't turn down a chance to tour the house where Joyce's companion was born? 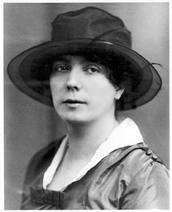 Nora Barnacle was born in March 1884 in Galway. While in her teens, a teenager named Michael Feeney fell in love with her, but sadly, he died shortly after from typhoid and pneumonia. Several years later another young man named Michael Bodkin fell in love with Nora, but he also took ill and died. Joyce later used this unfortunate series of events as the basis for The Dead, the final short story in the Dubliners. By 1904 Nora moved to Dublin and started working as a maid at Finn's Hotel. In June she met James Joyce during a walk, and he immediately and brazenly asked her out on a date. Nora accepted, but her supervisor wouldn't let her leave the hotel and she wasn't able to meet Joyce at the agreed upon time. She stood Joyce up, but he wasn't deterred; he asked her out again, and their first date took place on June 16, 1904 -- the day upon which the events of Ulysses occur. When Joyce's father initially heard Nora's name, he joked: "Barnacle? She'll never leave him." He was right. From that date on, Nora and Joyce stuck together. Not too long after they met, Joyce decided to take a self-imposed exile from Ireland, and he asked Nora to leave with him. They took an excursion through a series of European cities, until they ultimately landed in Trieste, Italy, where the couple stayed for 10 years. Along with being Joyce's model for Greta Conroy, the female lead in the Dead, Nora served as Joyce's role model for Molly Bloom in Ulysses, Bertha in Joyce's play Exiles and Anna Livia Plurabelle in Finnegans Wake. Her personality and experiences have influenced some of the most iconic characters in modern literature. Although Nora spent much of her life in the shadow of Joyce, she was the subject of a fabulous biography by Brenda Maddox called Nora, the Real Life of Molly Bloom. In 1999, the book was made into a critically acclaimed movie starring Ewan McGregor as Joyce and Susan Lynch as Nora. Director Pat Murphy cleverly seems to have based the image of Joyce in this scene on an actual photograph of Joyce playing guitar. If you click on my previous post Music in Ulysses, you'll see the similarity to the image in the video. Aughrim is a town in County Galway -- as such, the song is about a girl from Galway, just like Nora. The song, The Lass of Aughrim, is of central importance in The Dead -- it's the catalyst which motivates Greta Conroy to remember the young man named Michael Furey who died in a similar fashion to the two teenagers who died during Nora's youth. In Proustian madeleine-cake-like fashion, a flood of memories wash over Greta when she hears the Lass of Aughrim -- which causes her to reveal the death of the teenager to her husband, Gabriel. In the final lines of The Dead, as Greta falls asleep in the hotel room, Gabriel is left looking out the window in utter solitude, realizing that he's been deceiving himself for all these years -- he was neither Greta's first love nor her greatest love. The quote at the beginning of this post encapsulates his severe desolation and loneliness -- it's one of the most profoundly stirring passages in all literature. As you'd expect, my wife declined my invitation to visit the Nora Barnacle House Museum. "Why don't you go see it yourself, Michael. It's really not my thing," she said with a smile. "I'll go shopping." As she headed off in one direction towards the excitement of Galway's pedestrian shopping mall, I made my way through a quiet lane to the smallest house on Bowling Green which was once occupied by Nora and her family. As I entered the two-room house, I was shocked by how tiny it was; particularly since Nora lived in it with her mother and six siblings until she left in 1904. 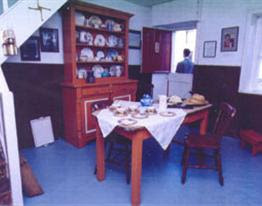 The room on the ground floor served as a living room and a kitchen. Upstairs there was a communal bedroom; I had no clue where the entire Barnacle family slept. The museum was staffed by a friendly young Irish woman sitting at a desk by herself; unsurprisingly, she had the slightly lonesome look of someone who spends a great deal of time in a house that few people visit. During the hour that I was there, no-one else came by. After touring the tiny upstairs bedroom, I went downstairs and started chatting with the woman in the museum; she told me she was studying to be an actress. She had a copy of the Dubliners on her desk, and we started talking about what a beautiful story "The Dead" was. As we spoke about the final passage, I asked her to read it aloud -- and she seemed very pleased with the change of pace. She did a beautiful job of reading the section of the Dead which I've quoted at the beginning of this post. There was electricity in the air as she read it. After all, it was based on the woman who lived in this house a century ago, the woman who suffered the deaths of Michael Feeney and Michael Bodkin, and the woman whose husband visited this house and wrote about the death of a fictional teenager named Michael Furey, echoing the deaths of the other two Michaels. And that day, another Michael was in Nora's house. As I was getting ready to leave, the young woman wanted to know if I was the mayor of a Canadian city. I told her I wasn't, but I was curious why she asked. "I don't know, Michael," she said. "You just look like a mayor." No-one had ever said that to me before -- and it's not something you easily forget. I wonder if the young woman might someday come across this blog and remember reading a passage from The Dead to a guy who looked like a mayor. As I left the petite museum and the girl from Galway, I headed towards the lively crowds of Galway's effervescent arts festival, and felt myself returning from the dead to the living. While researching this post, I read that the Nora Barnacle House Museum did not open last year due to budget cuts by the Irish government; I wonder if this tiny -- yet meaningful -- museum will ever open its door again. When you think of a popular television show, it usually doesn't take too long for the theme song to start playing in your head. 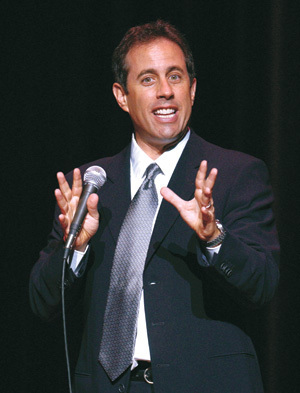 Just think of Seinfeld's signature slap-bass theme. Or take the theme from the original Star Trek where William Shatner begins by reciting the words "Space: the final frontier" followed by a memorable fanfare that boldly goes where no theme song has gone before. You get the idea. You don't really appreciate the full impact of a show or movie without knowing its music. The novel Ulysses also has a theme song. 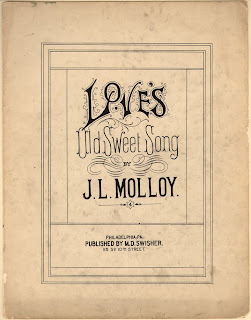 It's a charming sentimental tune called "Love's Old Sweet Song," and references to the song are scattered throughout the novel. Please click on the video below and listen to it as an accompaniment as you continue reading this post. In the fourth chapter of Ulysses, Leopold Bloom's wife, Molly, tells him she's decided to sing "Love's Old Sweet Song" at an upcoming concert -- and the song hovers in the characters' heads for a good part of the day. The song begins in almost a dirge-like fashion. It mentions the "dear dead days beyond recall" -- and paints a dark and misty picture of the world, and it refers to an old sweet song that "softly wove itself into our dream." Then there's a shift. As you hear the words "Just a song at twilight" the song brightens up, the time signature transforms into a waltz, and the listener somehow feels transported into a turn-of-the-century parlour. I'd be surprised if some of you weren't swaying back and forth to the refrain. We learnt in an earlier post that June 16th was the day in which Molly Bloom had an affair with her manager, Blazes Boylan. This song serves as a motif for her planned, and eventually consummated, tryst. Here are the lyrics to the song...you might wish to play the video once again as you read the lyrics. Up until now, we haven't spoken about the final chapter of Ulysses. The remarkable chapter, known as Penelope, is presented as an unbroken stream of consciousness with virtually no punctuation and few capital letters. It this chapter, Molly lies in bed in a dream-like state and the thoughts that float through her mind end up on the page. When you first read a section of the Penelope chapter it's a daunting jumble -- but when you begin to dissect its constituent elements, it begins to take shape and become clearer. "Frseeeeeeeeeeeeeeeeeeeefrong that train again weeping tone once in the dear deaead days beyondre call close my eyes breath my lips forward kiss sad look eyes open piano ere oer the world the mists began I hate that istsbeg comes loves sweet sooooooooooong Ill let that out full when I get in front of the footlights..."
Confused? Don't be...Molly is lying in bed and the song "Love's Old Sweet Song" is, quite literally, weaving itself into her dream. 1. First of all, don't be put off by the word: "Frseeeeeeeeeeeeeeeeeeeefrong" -- it's just the sound of a train that Molly hears as she lies in bed. If you say it aloud, it kind of captures the Doppler effect sound of a train rushing by. Try it -- you'll see. And she confirms it's a train when she says "that train again." 2. Next, Molly starts thinking about the "weeping tone" of the first line of Love's Old Sweet Song, and she remembers the lyrics "once in the dear deaead days beyondre call." The lyrics are somewhat distorted as she's thinking about the way she'll actually sing the words, elongating several syllables in the process. 3. Then she starts imagining what she will do when she sings the part. She reminds herself to "close [her] eyes" then hints that she should take a "breath" and keep "[her] lips forward...kiss...sad look...eyes open..." It's all stage directions. 4. After that she starts thinking about the words again: "ere oer the world the mists began I hate that istsbeg comes loves sweet sooooooooooong." Now you'll note that half way through the excerpt she says "I hate that istsbeg" -- what is she talking about there? She's pondering how tricky it is to pronounce each of the consonants in the phrase "the mists began" -- and she's hammering home the need to articulate the final "s" in the word "mists" before singing the next syllable in the song ("beg"). 5. And finally she thinks to herself that she'll "let that out full when I get in front of the footlights..." So once again, she's just imagining what she'll do when she sings the song. So, once you know the songs and music of James Joyce...what initially seemed like a daunting and dense section of the book starts to make sense. 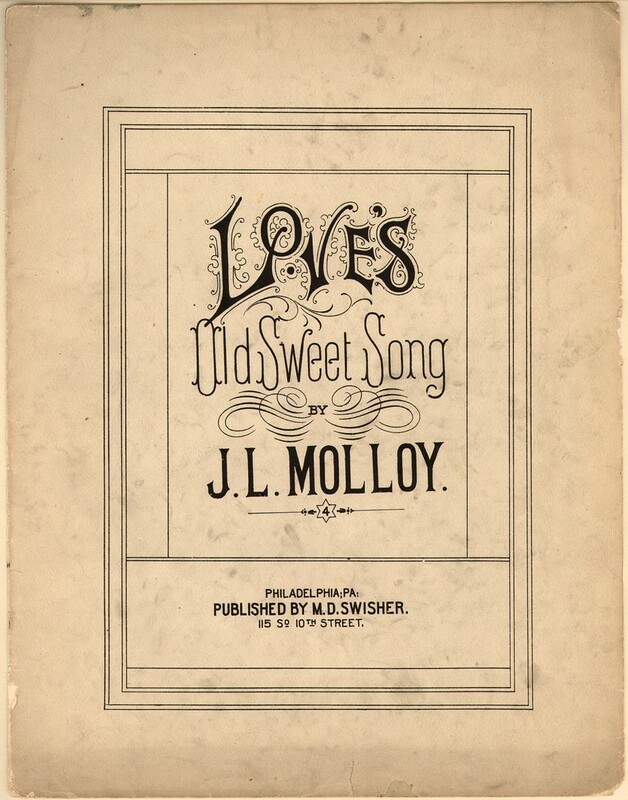 One final word on "Love's Old Sweet Song" -- most James Joyce aficionados know the words and music of this song so well that when they get together each June 16 to celebrate "Bloomsday" the participants eventually stand together and break into a version of the song. If you'd like to start becoming familiar with Ulysses, it wouldn't hurt to get to know this song. Some people would say: If you don't know this song, you don't know Joyce.